Immunizations are the most common recurring health-related procedure undertaken in childhood. For most children, these procedures can cause unnecessary stress and anxiety, which can lead to long-term non-adherence with recommended health care interventions and missed immunizations – but health care providers such as doctors, nurses and pharmacists can help. 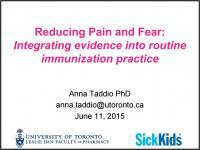 Clinical practice guidelines (CPG) developed by the Help ELiminate Pain in KIDS (HELPinKIDS) team at the University of Toronto provide four steps that demonstrate how health care providers can help mitigate pain during childhood immunization and provide guidance to parents. 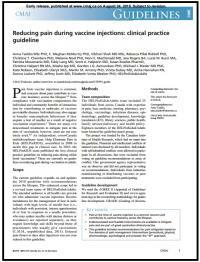 Below is a reference guide for health care providers on how to eliminate pain during immunization. These are scientifically proven ways of reducing pain in children during vaccination. Talk with parents and plan ahead to make the next vaccination less painful. HELPinKids&Adults – CARD. Preparing for vaccinations at school: A guide for school staff. Immunize Canada. 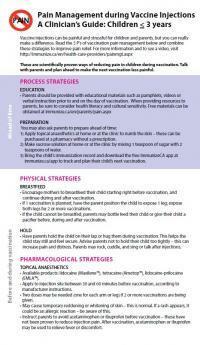 Reduce the Pain of Vaccination in Children Under 3 Years: A Guide for Parents. Immunize Canada. Reduce the Pain of Vaccination in Kids and Teens: A Guide for Parents.